The model for the story is a doctor named Kawafuchi Keiichi (52). After graduating from Tokyo University, he spent some time making a living off of pachinko and worked various jobs before becoming a hikikomori (shut-in) for a year. At the age of 30, he decided to enter the medical school at Kyoto University, and he finally became an intern at a university hospital at the age of 37. Kawafuchi wrote an essay-like novel about his experiences in 2002 that sold roughly 100,000 copies. 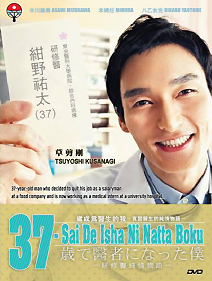 His follow-up book, “Furikaeru na Doctor,” was released in 2011 and is being used as the basis for the drama.